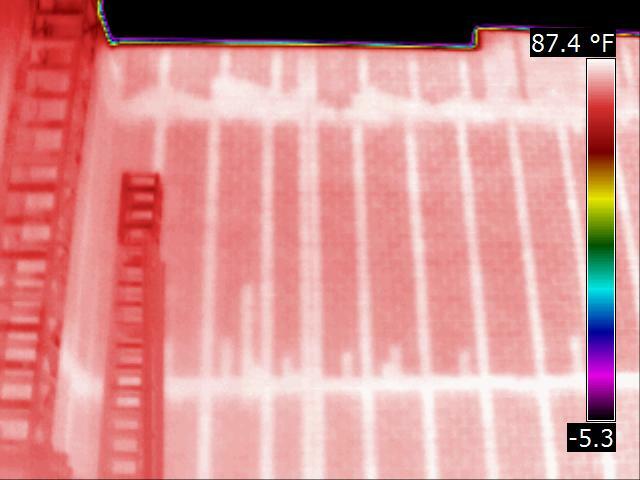 Infrared Construction Technology has become an excellent tool in evaluating construction components and diagnosing problems that may not be visually evident. Infrared cameras have become more thermally sensitive and less expensive over the last twenty years. The use of the infrared technology has expanded over the years as more people have become trained and experienced with the technology. Today, it has become invaluable locating and diagnosing problems in business and industry. Infrared Construction Technology uses basic science applied to specific problems to create awareness that can be used in Predictive Preventive Maintenance (PPM) applications, quality control and problem diagnosis. Infrared cameras can now measure 60 micro Kelvin (µK, about 1/10 of a degree in Fahrenheit ) or less and have sufficient resolution to provide visual clues about thermal indication that are commonly found in specific problems. 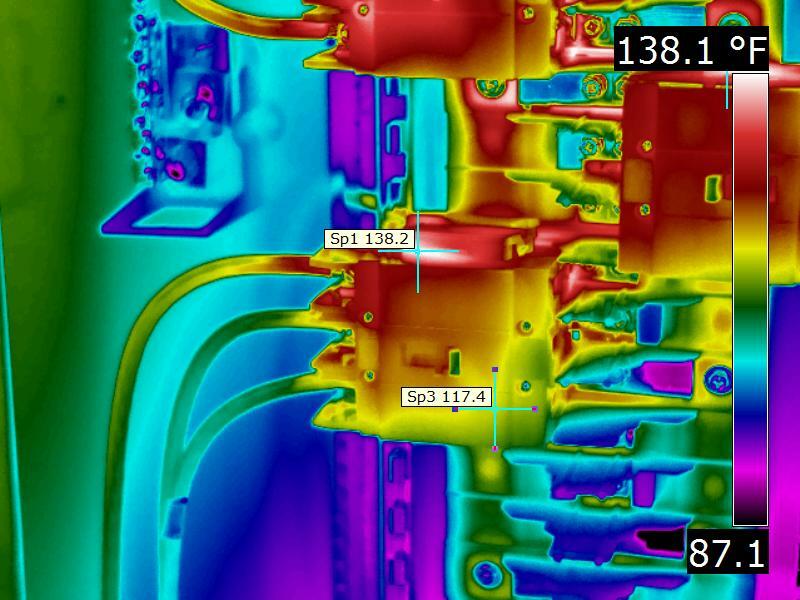 Having an infrared inspection performed can help save money by finding and solving problems before they get critical. Many insurance companies are now requiring that an infrared inspection be performed periodically to ensure that any exceptions which could cause failure are diagnosed and treated. Infrared Construction Technology can be used to measure heat generation from motors windings, bearings, wire connections and circuit breakers to find problems or conditions that indicate future problem as part of a preventive maintenance or property insurance program. Wire connections can generate a lot of heat which can overload it and cause power failure or fire. Misalignment in couplings can cause excess heat generation which can cause the system to fail early. The following link will take you to our website that focuses on Infrared Electrical scans. Let us use the Infrared Construction technology to meet your Preventive Maintenance and IR Switchgear insurance needs. Infrared block wall scans are the best and most cost effective quality control measures in the block wall masonry industry. Quik-Brik and masonry block wall make for quick and efficient construction. Structural integrity of these structures is built in by installing rebar and grout into specific block cores at specific locations in the block wall to carry design loads. Energy efficiency is installed using foam products in the other ungrounded block cores. Infrared construction technology can specifically locate the grouted and foamed cores and even more importantly areas where structural integrity is weakened by missing grouted core and energy efficiency lost by uniformed cores. The ideal part of the day to perform block wall scans is at night. During the day, the sun heats up the wall but the foam insulation and grout will heat up differently. As the sun starts to go down, an infrared image can be used on the wall to see the grout cores and the foam to ensure it was installed thoroughly and correctly. The following link will take you to our website that specializes in Infrared block wall scans. Low sloped roofs are commonly used on most commercial buildings. The almost flat roofs are the most efficient methods to both protect a given area and collect / discharge participation to the ground around the structure. The low slope allows slow water flow across the roof surface and the potential for roof membrane leaks. Infrared Construction Technology allows you to see where the water is under the membrane and help locate the leak source. The areas are then outlined with paint to allow for cost effective repairs. Roof repairs cost less than roof replacement. Roof replacement often involves installing expensive energy insulation improvements that can add to the project cost. 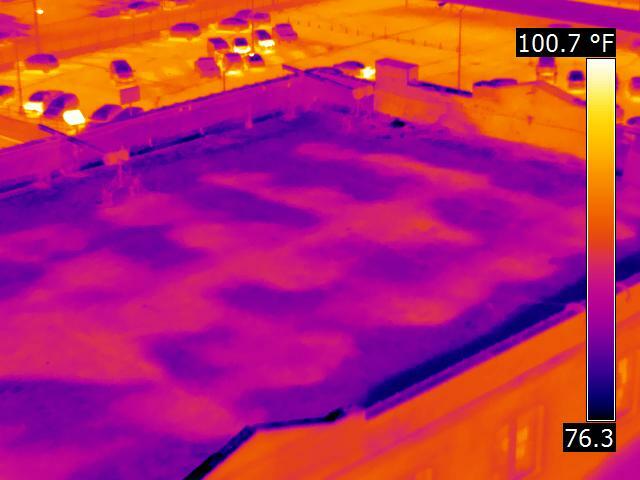 The ideal time to perform an infrared roof inspection is at night. During the day, any moisture that leaks under the roof will heat up by the sun. Once the sun goes down and the roof starts to cool off, the moisture will present a different thermal signature from the rest of the roof and will be marked to show which areas need replacing. 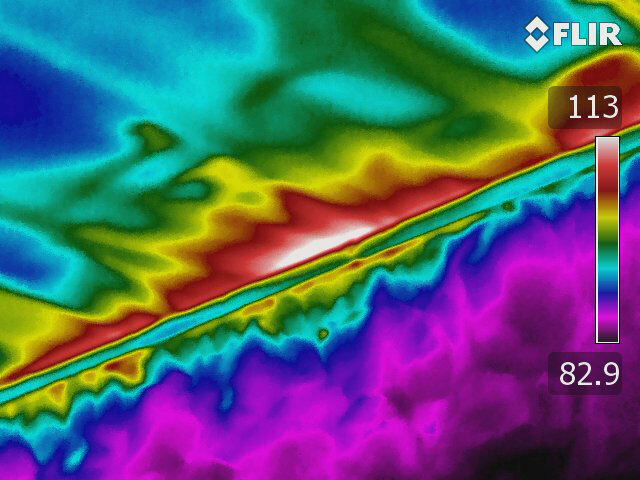 The following link will take you to our website that specialized in Infrared Roof scans. When an Infrared camera is used in conjunction with other technology, amazing things are possible. A Blower Door is a special device that is used to lower the pressure in a structure to measure air leakage in the structure. The more the structure leaks air, the more the heating and air conditioning systems must run to maintain a given temperature in the building space. The more Air Changes per Hour (ACH), the more the systems run and the higher your utility bills. Reduce the air leaks and reduce the length of time the HVAC systems run. The Infrared Construction Technology allows us to see the subtle temperature changes in floor, wall and ceiling surfaces cause by these air leaks into the structure. The blower door blows air out of the building which makes outside air try to infiltrate inside. Attic air can leak from ANY penetration in the ceiling. Outside can leak in from any wall penetration such as switches, outlets, windows, and doors. Many people assume the first things they need to do to improve efficiency is get a new expensive air conditioner, add insulation to the attic, and get new windows. While these things certainly help, they are very expensive and can have a longer return on investment. Doing simple things like air sealing the building envelope is cheap, the ROI is fast, and, depending on the age of the home, can be a huge saver for bills. It is truly amazing where you will find air leaking into your house or business. The following link will take you to our website that specializes in Infrared Energy Audits. 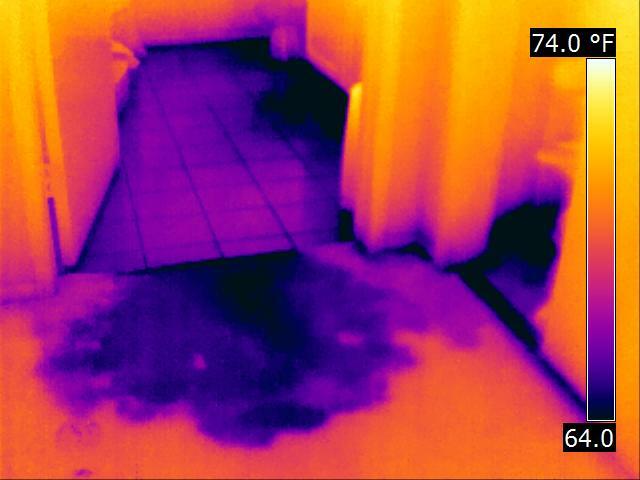 Infrared construction technology is effective is seeing water and other fluids in floors, walls, tanks and pipes. Water leaks and moisture can be visible based on slight temperature changes caused by evaporation or in the case of stucco walls changes in wall density because of moisture in the wall. Industry uses Infrared cameras to measure tank levels and pipe constriction. The following link will take you to our website that specializes in Infrared water intrusion. Infrared – A Closer Look Inc. is a regional Infrared Construction Technology company that can meet your Infrared Inspection needs. Give us a call today at 940-891-3803 and let us bid on your project.